Michael Henry Lee is appearing on the Tattooed Poets Project for the fourth consecutive year, and it is always a pleasure to share his work. 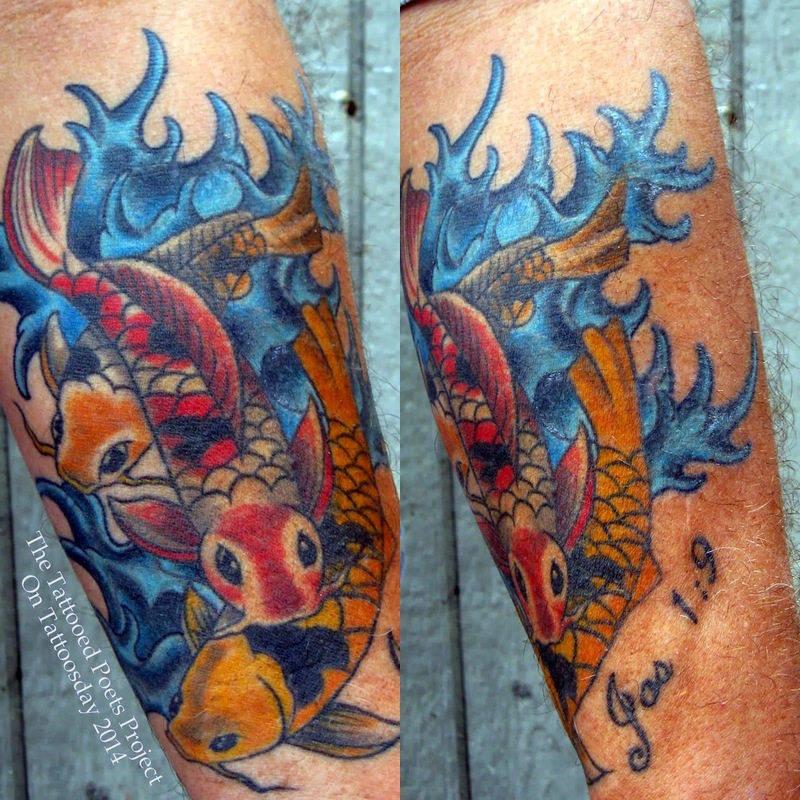 “Koi have long been revered by the Samurai of Japan for their; courage, virility, and immortal character. Combine that with Joshua 1:9 from the old testament (Have I not commanded you to be strong and of good courage, neither be fearful or of doubting mind, for I the Lord God am with you wherever you go) and you have for me, the ultimate stay-strong tattoo. The composition was designed by [me], and inked by Tattoo Mike: owner of Tattoo Garden on Saint Augustine Beach in Florida. The wave design was done at The Lovely Pearl Studio by owner Krista Monahan in downtown Saint Augustine." The preceding poems first appeared by their respective order in: Icebox, Haiku News and Mainichi Daily News. You can check out Michael Henry Lee's previous contributions here, here and here. Michael Henry Lee’s work continues to appear on or in: Frog Pond, Heron’s Nest, Modern Haiku, and Mainichi Daily News among numerous others. Lee is a husband; of over thirty years, father, and grandfather, animal welfare supporter, and bonsai artist. His work in maintenance, for a sprawling condominium complex on Florida’s intra-costal provides an abundance of inspiration for his Japanese haiku and senryu poems. As always, many thanks to Michael Henry Lee for his contribution and continued support of the Tattooed Poets Project on Tattoosday! This entry is ©2014 Tattoosday. The poems and tattoo are reprinted with the poet's permission.